I created this for the Fab Friday challenge that was posted a couple of weeks ago, but alas, I didn't get it posted to the website in time. It’s still a pretty fabulous Halloween card in my opinion. So here is how I made it. This card really is pretty simple. I started off with a piece of Basic Gray card stock cut 5-1/2” x 8-1/2” and scored it at 4-1/4”. I cut two strips of Howlstooth and Scaringbone DSP 3/4” x 4” and one strip 1” x 4-1/4”. I used Paper Snips to cut one end into a dove-tail shape and adhered the three banners next to one another on the card front. I used the Window Frames Framlits on a scrap of Whisper White and a scrap of Basic Black card stock. I stamped the bats from Wicked Cool all over the Whisper White window frame in Basic Gray ink. To get the two shades of bats ink up the image then stamp the image onto the card stock twice before re-inking the stamp. I used my Embossing Buddy on the label then stamped the greeting from Delightful Dozen onto the card stock in Versamark ink. I covered the stamped image with Black embossing powder, tapped off the excess, and heated it with my Heat Tool until it was shiny. I used the Festive Paper Piercing Pack, Paper Piercer, and Stampin’ Pierce Mat to add pierced holes around the edge of the Basic Black label. Then I adhered the stamped Whisper White window frame onto the larger Basic Black window frame. I applied Silver Dazzling Details onto the wings of the darker bats, and regular Dazzling Details onto the wings of the lighter bats. I set this aside to dry. 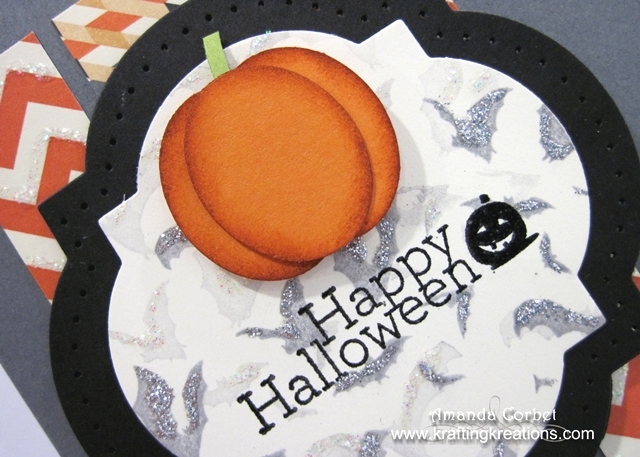 Next I used the Small Oval punch on a scrap of Pumpkin Pie card stock to punch out three ovals. I sponged around the edges of all three ovals with Cajun Craze ink. Then I adhered two of the ovals behind one oval with 2-Way Glue Pen to make it look like a pumpkin. I had a small strip of Lucky Limeade card stock that was a scrap so I cut off about a 1” long piece and adhered it behind the pumpkin for a stem. Once the Dazzling Details dried completely I adhered the window frames layer onto the card front with Stampin’ Dimensionals and then adhered the pumpkin onto the label with a Stampin’ Dimensional. Then I used the Paper Piercer and Stampin’ Pierce mat to pierce three holes in the bottom right hand corner of the card front and added three Glimmer Brads. 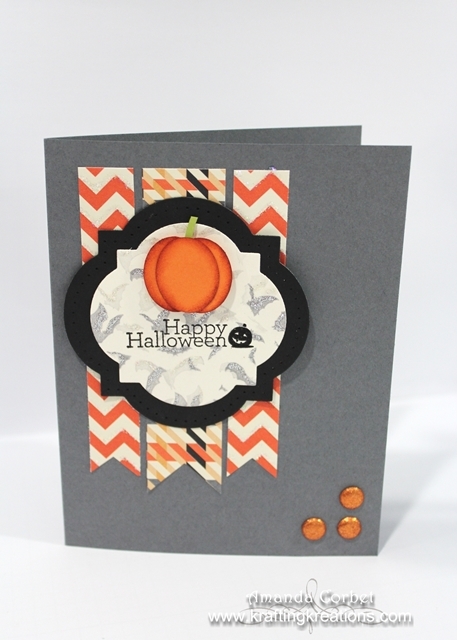 I just love how this Halloween card turned out! I will have to tryharder to get my Fab Friday cards posted earlier in the future. Cut It Up Eek! Boo! Ahh!